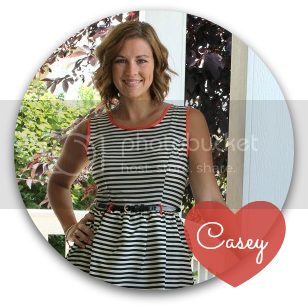 Love, Life, and the Pursuit of Happiness: Gluten Free Buckeye Brownies and Baking Set Giveaway! 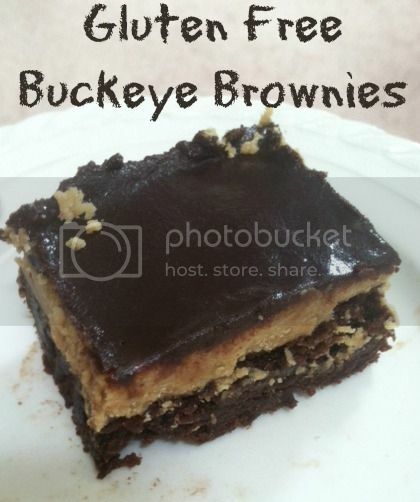 Gluten Free Buckeye Brownies and Baking Set Giveaway! Several years ago my Mom was diagnosed with celiac disease. At first, it was a huge ordeal to find gluten free products, learn what she could and couldn't eat, and train my kids to keep their fingers, spoons, and knives out of EVERYTHING. Slowly, it became a habit, but not necessarily a delicious one. A lot of the food was still bland, tasted like cardboard, or was so hard you couldn't bite into it. Insert Betty Crocker's Gluten Free baking mixes. When Betty Crocker first started advertising for their mixes I was a little hesitant to buy any. Then, I tasted the brownie mix at my Mom's house and man, oh man. Even my husband admitted to not being able to tell the difference. They were really good. Since then I have been able to try a good variety of their baking mixes. Banana bread, cookie and cake mixes and also a rice flour blend, they are all amazing and work well into recipes too! So when My Blog Spark contacted me about doing a review and giveaway, I was more than pleased! So, today I give you Gluten Free Buckeye Brownies. I tried this recipe last week and I'm pretty sure I gained 4 lbs off of the amount I consumed over a two day period. It was pretty ridiculous. They can be made with Betty Crocker's Gluten Free Brownie mix for a fabulous gluten free dessert. Cook the brownie mix according to directions. Allow to cool completely. In a bowl, mix peanut butter, butter, powdered sugar and milk until smooth. The mixture will be thick. Spread onto cooled brownies. Then, heat the cream in a saucepan until ready to boil. Pour over chocolate chips and stir until melted. Pour over brownies and smooth with a spatula. Refrigerate for 1 hour or until set. Now, here's the good part! My Blog Spark and Betty Crocker have put together the cutest baking set for one lucky reader! I mean, who doesn't need a pink spatula?! 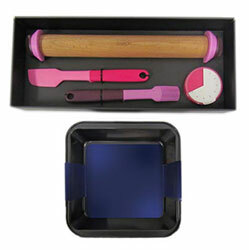 Your prize pack will come with a Joseph Joseph Baking Tool set including a adjustable rolling pin, pastry brush, spatula, and kitchen timer. You will also get a Danesco 8x8 non-stick cake pan so you can do some amazing brownie cooking of your own?! This would be a dream to win! I was really looking for a perfect rolling pin and baking set! Thank you!